Welcome to Married Life: Two! In the time we were traveling in Saudi he started speaking in complete sentences including using "I" to refer to himself! Just Thursday morning upon waking up he told Brian that he wanted to "eat macaroni and cheese tonight" so I think he's also starting to understand time. Wow! 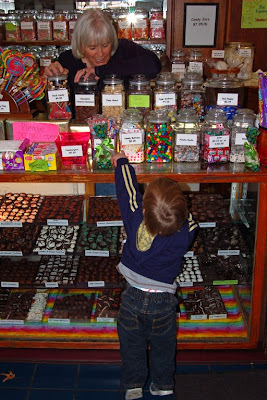 When he really wants something, like chocolate, he will say "thank you, chocolate" before you've even given it to him. I guess that's his way of assuming he'll get it! And of course it's really cute! Also, Friday morning, one day before turning two... he figured out how to climb out of his crib! I had seen him put his leg up earlier this week and I pushed it back down hoping that he would stay in a bit longer... no such luck! We were just waking up and could hear him calling and suddenly the voice got louder and there he was standing in the hallway! I put him back in and asked him to show me how he got out so I could make sure he wasn't going to hurt himself between now and when we can get his bed put together. He just swings a leg over, rolls over the top and lets go with his legs while hanging onto the top rail. He's so tall that it's not much of a drop! I guess I know what we'll be doing during spring break this week... putting together the big boy bed! He's been a bit behind in some of the more physical activities like climbing (for which I am quite grateful!) but is more than making up for it verbally! The candy lady giving the birthday boy a chocolate pretzel! On our trip we were working on the alphabet song since he was saying the "ABCD" part and also because you can sing easily while in the car a long time. He's gotten all the way up to I and then will skip J and go on to K. So I always stop and say, wait, J is for Uncle Joel. Now when I say "wait" he automatically says "J is for Uncle Joel". He also knows most of the rest of the letters, especially the WXY and Z, but doesn't quite have them in the right order. He still weighs in at about 33 pounds and I haven't measured him either, but his head is up to counter height and we have tall counters! Oh, and his 2 year molars are coming in on the bottom, I'm sure the top will follow soon. This is Addison and she is 6 months older than Cory... she is the daughter of one of the college friends. We were 4 couples and only 2 of us have kids so far. We had 2 condos there and it was a lot of fun just hanging out and playing games and eating. 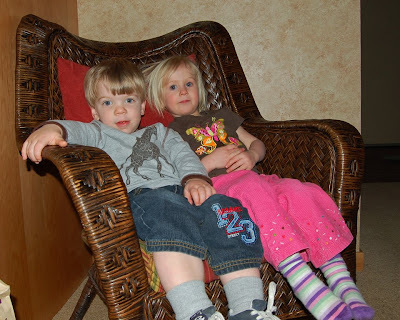 And no, I did not pose this picture, they wanted to sit in the chair together so of course I had to take a picture of the cuteness! 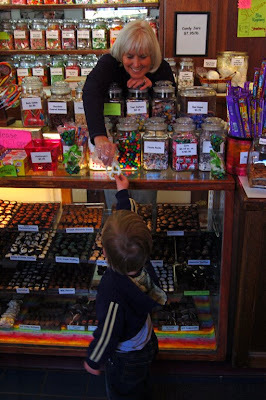 We went downtown on Saturday since Dave's favorite place to go is the candy stores! The one pictures above is called Goodies. Then we went to the toy store next door and Cory loved the train table so much he had a major meltdown when it was time to leave. I think it was a combination of tired and too much candy! Otherwise we had a good weekend although it was a bit close on the heels of our big trip and still a 6+ hour drive. Ugh! 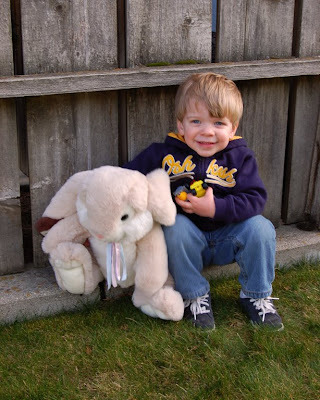 Birthday boy and his bunny! Here are some pictures from when he was first born (including the bunny) and from one year old right before we went to Arizona last year. Sentences? Awww :) So cute! !